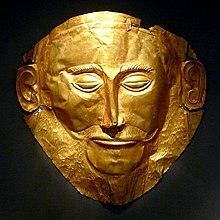 Agamemnon (Greek: Ἀγαμέμνων) was a legendary king of Mycenae, as told in The Iliad. The son of Atreus and Aerope, he was the brother of Menelaus, and the commander of the unified Greek forces in the Trojan War. His wife was Clytemnestra, with whom he sired Iphigenia, Electra or Laodike, Orestes and Chrysothemis. Homer's Iliad tells the story of his quarrel with Achilles, the greatest of the Greek warriors, in the final year of the war. Upon his return home from Troy, Agamemnon is murdered by Aegisthus, the lover of Clytemnestra. The story of his return home and subsequent murder is featured in the Odyssey (5.266). Wikimedia Commons has media related to Agamemnon. This page was last changed on 21 September 2018, at 14:39.